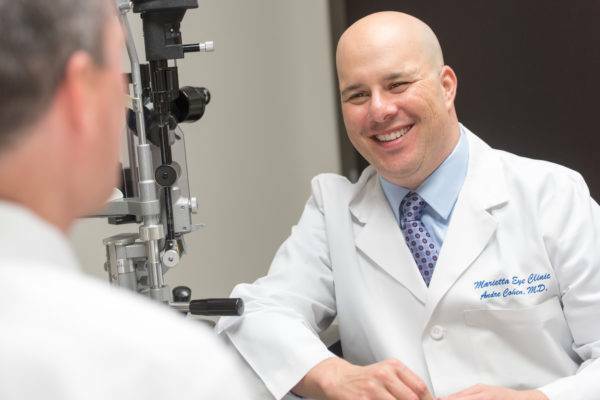 After it has been determined that you are a candidate for the LASIK procedure and your pre-operative evaluations have been completed, it will be time to correct your vision. You will be escorted into our fully-integrated LASIK suite. Your eyes will be numbed using anesthetic drops. An eyelid holder will be placed against your eyelids in order to prevent you from blinking. The first step in the LASIK process is to create a thin flap in the center of your cornea. We use a high energy IntraLase™ laser to create a blade-free flap. The IntraLase method replaces the traditional LASIK method which uses a hand-held microkeratome metal blade to create the corneal flap. The IntraLase method is safer, more accurate and reduces flap complications. The flap is folded back to allow access to the underlying corneal tissue. Your eye is positioned under the laser microscope and you look directly at a target light. Our new WaveLight Ex500 Excmer Laser is used durring the second step of the lasik procedure to reshape the the surface of your cornea. The doctor uses a cool-beam excimer laser (VISX™ Advanced CustomVue®) to reshape the unique surface of your cornea to correct your nearsightedness, farsightedness or astigmatism. This laser procedure usually lasts less than 10 seconds. Once the laser treatment has been completed the doctor will put the flap back in place, where it will bond safely without the need for stitches. After LASIK some patients report a slight scratchiness that usually dissipates within 24-48 hours. Over the course of the next few weeks most patients continue to see visual improvement.